The modular pool can be equipped with a great amount of accessories, of which a moveable swimming pool floor and an underwater treadmill. 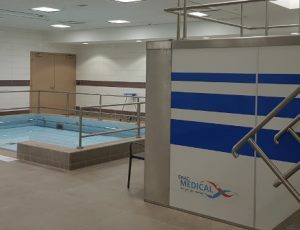 A modular pool is suited for treatment of individuals or small groups. 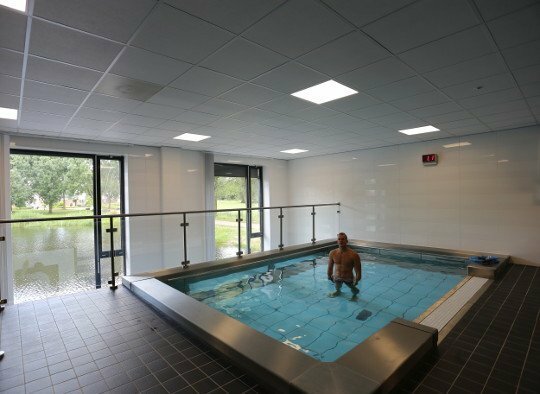 The measurements of the pool make it suitable for all known methods of hydrotherapy. Our knowledge centre offers a clear description of these methods in a few chapters. EWAC Medical has designed and built modular pools for over 25 years and has successfully finished more than 1.000 projects worldwide. We continually work on improvement and innovation. 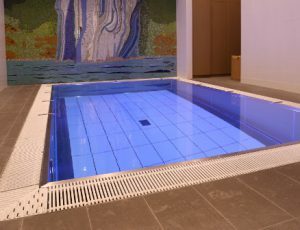 Modular pools are designed and tailor made to the clients needs, and can be installed in existing rooms. EWAC Medical has proven there is a solution for every situation. That is why EWAC Medical is world market leader in hydrotherapy. 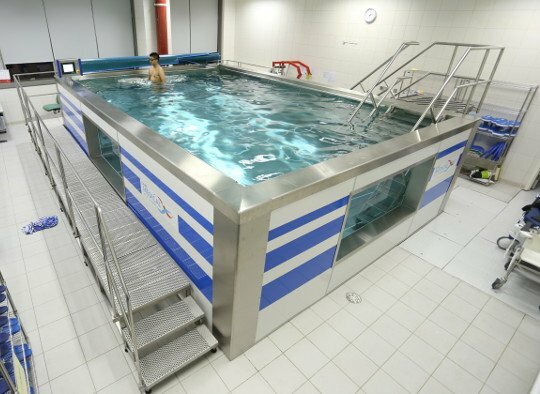 The modular pool is a welcome addition to physiotherapy practices in general. Especially treatment centers that have a large number of postoperative or arthritis clients will benefit greatly by the many possibilities the modular pool has to offer. Due to the diversity in various sizes and options, this pool offers progressive application possibilities, even in small clinics and practices. 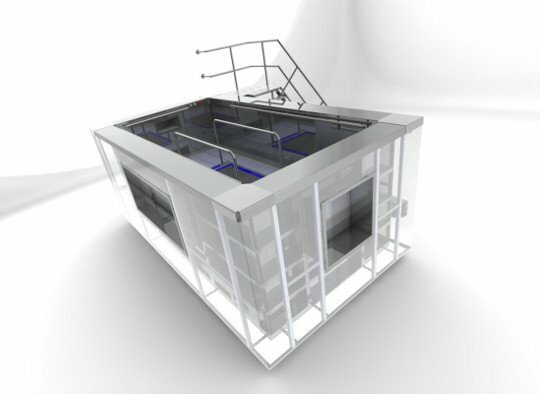 The modular pool is completely free standing and therefore it can be placed in any free allocated space. Thanks to the modular concept, the pool has unprecedented simplicity when it comes to installation, even in already existing spaces. 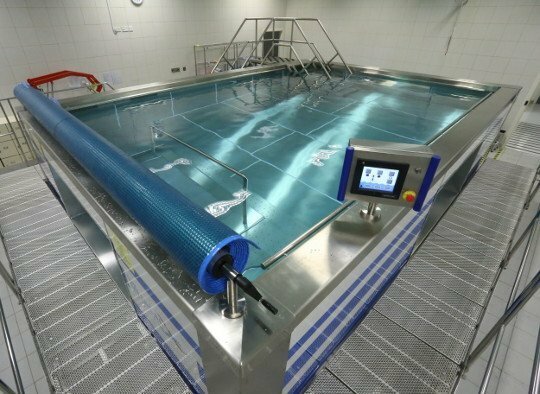 The pool can be equipped with a large variety of options, like a movable swimming pool floor, underwater treadmill, underwater observation windows, water current equipment and cameras. To see more options availble, check our knowledge page. The pool has a standard size range from 2x3m to a maximum of 20x20m. Different shapes are possible. 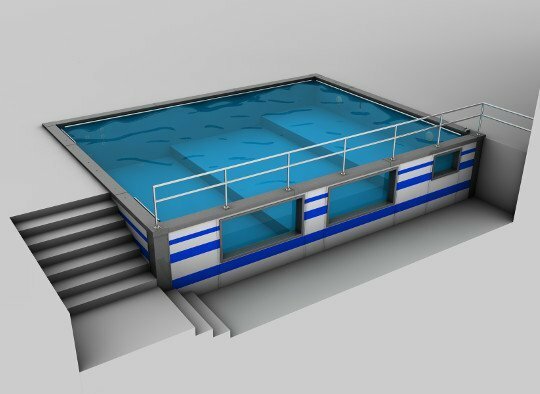 The EWAC modular pool can be supplied with many different options, like observation windows, handrails, watercurrent system, underwater massage system, underwater lighting, stairs with a landing, intergrated waterhydraulic lift with seat, etc. 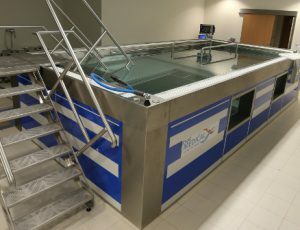 As a recent development, an underwater treadmill can also be added to the pool. Check out our product configurator for more information. A modular pool can be produced in any depth necessary. Multiple depths are also possible. The modular pool can be fitted with either skimmers or an overflow rim. Injection points located in the modular pool wall are used to reinject treated water into the pool. Therefore the pool floor is entirely flush. The modular pool is equipped with a drain so that it can be emptied completely. 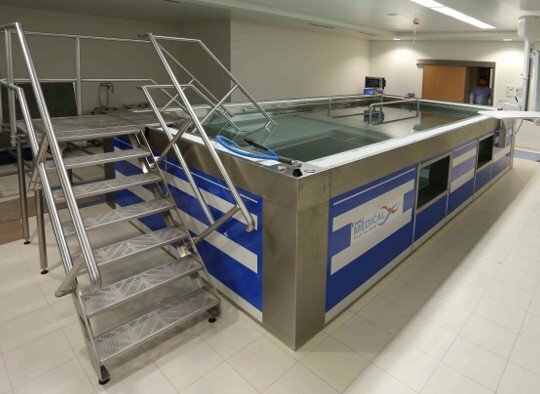 EWAC Medical does not only deliver modular pools, but also contributes actively in acquiring and dispersing knowledge about hydrotherapy. 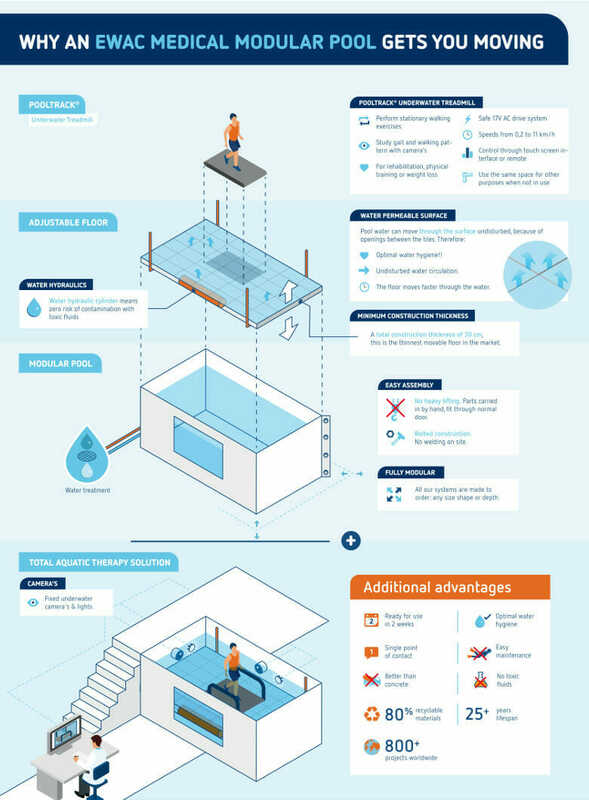 On this page you will find more in-depth information about all the aspects that come into play when applying a modular pool during rehabilitation. The pool itself is constructed out of stainless steel (AISI 316) panels. The inner sides of the pool are smooth, which eases cleaning on the waterline. The bottom panels are equipped with a thick isolation layer that eliminates small imperfections of the surface on which the pool is placed. The outside of the pool is finished with white aluminium sandwich panels, which can be decorated. The top edge is made out of stainless steel and has rounded corners. Adjustable floor By using a moveable floor the depth of a pool can be adjusted, and with that also the load on the lower limbs and back of the patient. An adjustable depth makes it possible to create the right circumstances necessary for proper rehabilitation. 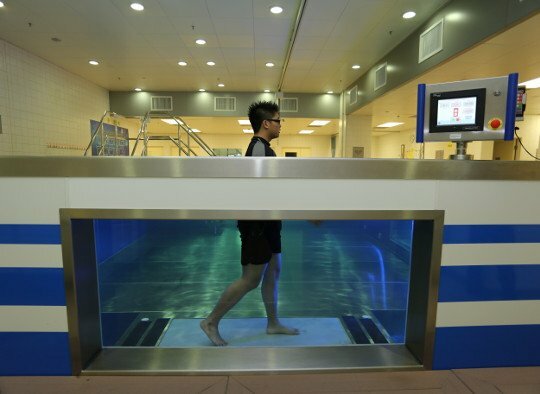 Underwater treadmill Underwater treadmill can be used to perform static walking exercises. The advantage is that the therapist can continuously watch and correct the patient’s movements from one position. This reduces the need for a large swimming pool. Observation window Each side of the pool can be equipped with underwater windows. This provides the therapist a complete view of the actions performed by the patient. Underwater bicycle The underwater bicycle is especially designed for excercising circular motion in water. The unique feature of the underwater bicycle is that the resistance increases progressively with the rotation speed of the pedals, which makes it extremely suitable for rehabilitation purposes. Entrance steps with landing To make the pool more accessable it can be equipped with steps that also contain a landing. This way mobile patients can either enter the pool with assistance, or on their own. Immobile patients can make use of a patient lift. 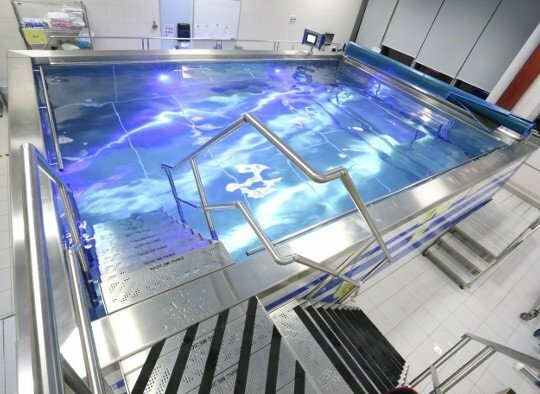 Integrated pool lift To get patients into the pool easily, the pool can be equipped with an integrated water hydraulic pool lift. Parallel bars Parallel bars provided with bottom plates for easy placement in any random position in the pool. The parallel bars can be used to perform walking exercises. Obstacle course For use in balancing exercises. Can be used in combination with Halliwick or the Bad Ragaz Ring method. Underwater camera This special underwater camera enables the therapist to track the movements of the patients, and if necessary make recordings for further analysis. By comparing images from multiple sessions one can get a clear picture of the progress made by the patient. Handrail The handrail is located on the four inner sides of the pool. Patients can easily hold on to these handrails to stabilise themselves. The handrail can also be used to mount multiple accessories. Counter current unit or jetstream Countercurrent unit or jetstream. A jetstream offers exercise resistance to the patient moving against the flow. A wall nozzle produces a strong water jet which is aimed at the patient, and depending of the required exercise load, can can be softened with air. Underwater lighting, cameras Lighting is recommended to improve vision through e.g. underwater windows. The lighting can be monochrome or multi color. In addition, the pool can be equipped with an underwater camera for motion analysis. Overflow channel An overflow channel is the best solution to maintaining an optimal water quality. Around the pool just the surface will be skimmed to remove floating particles out of the pool quickly. In countries where the highest demands on hygiene are set, overflow channels are compulsory. Skimmers An alternative for overflow channels are skimmers. Skimmers will be built into one side of the pool, or more sides in case of larger pools. Skimmers also skim the surface of the water and are very effective in removing floating particles. Hydro massage Hydro massage is a very useful tool for relaxation exercises. Three or four nozzles can be built into the side of the pool and provide a powerful water stream. This water stream can optionally be softened by mixing in air. Underwater massage An underwater massage system can be built in for the therapist, so that the therapist can apply an underwater massage. Ceiling lift A ceiling lift can be attached to the ceiling to lift patients in and out of the pool. The lift can be equipped with a special sling. The lift can be used to lift patients up to 250 kg/550 lbs. Pool cover This cover will be produced corresponding to the measurements of the pool. The cover reduces evaporation of the water which helps to save energy. Water treatment Depending on the size of the pool a customized (sand) filter system can be included. Built by EWAC Medical, our treatment plants meet the highest standards in the field of water according Dutch WHBVZ / Vlarem and DIN 19643. To ensure optimal water quality, EWAC Medical delivers a water treatment installation. This water treatment installation is especially adapted to be used in therapy situations. This installation consists out of the following prefab components that can be easily assembled on location. A cartridge filter system that features a polyester filter, manometer and a vent (for pools with smaller dimensions). A sand filter that features a manometer, a vent and a flow back valve (for pools with larger measurements). The capacity depends on the size of the pool. A semi self-suction pool pump equipped with a prefilter and couplings. The capacity depends on the size of the pool. Comprising out of an automatic measure- and control panel for chlorine and pH, dosing pumps and PE containers for storage of the chemicals. The measure and control panel digitally displays the values of the free chlorine and the pH. The control panel signals the relevant dosing pump when a value deviates from the programmed value. This cabinet controls all the functions of the filtering system and additional pool equipment. The supply voltage of all control elements is 24 V. All connected electric equipment is secured through thermal and normal fuses. The front panel contains all the switches and indicator lights: green for a normal operating function and red for fault conditions. Furthermore, all faults can be collected and forwarded to the Building control system. Possible switch functions for the equipment in the therapy pool come, through a control with the pool, back to the general control cabinet. A few examples of previous projects.